The scale can be a cruel tool and cause the most emotionally strong person to break out into tears! 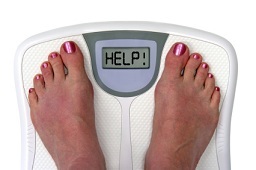 In order to keep your spirits high when on a weight loss plan, do NOT weigh yourself more than every couple of days. In fact, I recommend to my clients to do it no more than once a month. Now, while this can change from person to person, MOST people tend to find it frustrating and disappointing when the numbers are not reflecting what we feel they should. The reason is because the scale doesn’t always reflect weight loss in terms of what is truly being lost. So if you are retaining water or even building muscle, the numbers may say one thing but it doesn’t necessarily mean FAT! Also remember that, when weighing yourself you should do so first thing in the morning before consuming ANYTHING (water included) and with minimal-to-no clothing on. Find other ways to gauge your weight loss success such as taking your bodily measurements (and RECORDING them down) and using an article of clothing that fits rather snugly now so that you can gauge your success by how loose it begins to fit. I surely hope you enjoyed this tip… check back often for even more great weight loss and healthy tips!